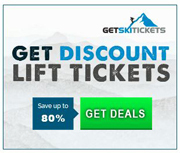 DEAL: Three to Seven Day discount ski tickets at 18% off - all are 18% off. For regular discount ski tix: All purchases through this website are non-refundable and non-transferable. Must be purchased at least 7 days in advance. Please print and present this Itinerary Email Voucher with a picture ID in order to redeem your services at the Pass Office. It is located next to the main ticket window, in the Tram building. Voucher may only be redeemed once by the traveler listed on the voucher. *Children 5 and under ski free.